Dr. Ara Nazarian has been placing dental implants for several years. 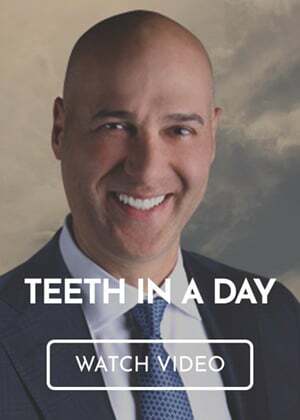 He is recognized professionally as one of the few practicing dentists who is an “in-demand” expert for training others via regional seminars and national conventions. Call today to request an appointment with our dental implant dentist in Troy, MI. Dr. Nazarian provides a wide range of services, including dental implant surgery. Unlike other dentists, Dr. Nazarian is able to keep costs down for his patients with fewer referrals to outside specialists. Our dentist handles most (if not all) of the dental implant process under one roof. Dental implant surgery, for some patients, may require the extraction of several teeth and/or the possibility of bone grafting treatments. Our dental implant dentist provides extraction services that are unsurpassed in southeastern Michigan. Dr. Nazarian uses proprietary protocols to remove teeth in minutes, not hours. Bone grafting can be planned or unplanned. For example, difficult extractions may require grafts to replace damaged bone tissue. Dr. Nazarian provides bone grafts on an as-needed basis during extraction. No extra appointments needed. Soft tissue loss accruing to tooth removal, gum disease, or other unique tissue conditions are commonly dealt with via the growth of healthy, new tissue. Our use of the latest technologies in tissue regrowth typically provides more than ample regeneration of bone and gum tissue where it is needed the most. Our dental implant dentist always does this, not only for oral health reasons, but for cosmetic reasons that are typically desired by many of our patients. Many periodontists and oral surgeons have acquired specialty skills in dental implant placement, yet are not involved with the actual placement of individual teeth (crowns) or a span of teeth (conventional bridgework). Last minute adjustments or changes needed during treatment are best handled by the dentist who is actually replacing the teeth. Otherwise, the referring general dentist may not be able to accommodate the changes that were made by the specialist. This is a common source of treatment errors. Dr. Nazarian takes 3D scans to diagnose conditions and recommend the best tooth replacement options. During your consultation, Dr. Nazarian will also help you explore the different types of dental implants. For example, he may recommend all-on-four implants to replace an entire arch of teeth. Our patients recognize, almost immediately, the considerable savings gained by eliminating the need for outside referrals. Our technologies and advanced treatment protocols assure that no expensive visits to specialists will be required. Our use of advanced diagnostic and treatment planning services assures the best choice of treatment and restoration (in terms of treatment dollars) that a patient can make. Additionally, the thoroughness of assessment eliminates a common concern that expensive retreatments will be necessary in the foreseeable future. Lastly, patients who take advantage of our sedation support services can literally undergo a complete treatment (full mouth reconstruction) in only ONE appointment. No inconvenient, costly multiple visits that might require several months with other dentists. While sensible dentistry is practiced by nearly every dentist, there are a select few who do their best to deliver what is MOST sensible, in terms of what is possible with tomorrow’s technologies. Dr. Nazarian offers dental implants to help patients smile with confidence after tooth loss. To request a consultation with our Troy, MI dental implant dentist, call the Premier Dental Center at (248) 457-0500.